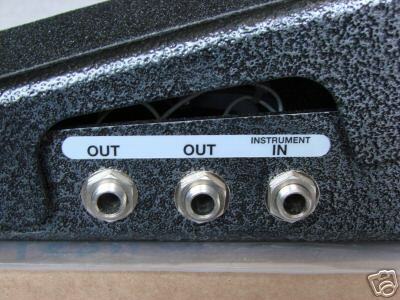 This pedal is the same as the regular profile pedal, except the back most output is converted to a tuner out for use in tuning your instrument during active playing time and you can have your pedal in the completely off position or on position and the tuner will receive the same signal to be able to detect the proper tuning of your guitar. Between numbers or sets, you may tune with accurate precision. This option raises the price $20 to $309 instead of $289 for the regular profile without this option. Well worth it and I recommend you get a tuner out option. OVERSEAS BUYERS WILL HAVE TO PAY USPS PRIORITY MAIL INSURED, IN MOST LOCATIONS IN EUROPE AND ELSEWHERE IN THE WORLD. You may purchase on this site with VISA, MASTERCARD, OR DISCOVERT credit or debit cards or PAYPAL. There is a 90 day warranty included with the pedal and a 30 day free look with the pedal also. This is a USA made pedal, not a foreign pedal that can't be easily repaired. This is a quality pedal, and you get a quality built piece of equipment. 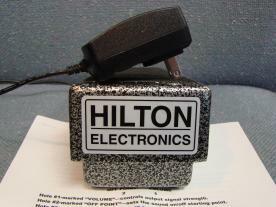 Please only use the Hilton 24 volt positive tip power supply that is also regulated power supply with this pedal. OVERSEAS BUYERS will be provided a power supply that will plug into their own overseas wall plug at no added cost.